Sometimes people complain that the current generation of young people are losing their interest in and enthusiams for Science Technology Engineering and Maths (STEM). However, anyoine who visited the Primary Science fair at the Young Scientist Exhibition in the RDS this week could not possibly believe that these complaints are true. Yesterday, I was scheduled to help demonstrate the Watson system at the IBM stand in the afternoon, so I came to the RDS early and spent the morning wandering around the exhibition. The first sction I visited was the PrimaryScience sectioon and the enthusiasm and energy of the young pupils demonstrating their work was wonderful to see. They were clearly very enthusisatic about their projects and rightly proud of what they had done. The Mount Sackville project "Smart Energy" which looked at ways that the girls could be less wasteful of electricity both in school and at home. Of course I am biased by the fact that I was involved in launching this project, but the reality is that I had relatively little to do with the project. Once I introduced the girls to the topic they embraced the it with great enthusiasm and did not require much help. They used the current cost meters that I had set up for them to chart enetric usage and they summarised it in some wonderful charts. They also came up with great ideas for how they could be more effecient. I was also pleasantly surprised to see how prominently they acknowledged the help they got from IBM. The boys who were presenting the Unlimited Energy stand had built a number of different devices that showed different forms of energy being applied. Unfortunately I didn't record the name of their school, but I couln't help being impressed by the amount of enegry that the boys were putting into their involvement in the science fair as the battled with each other for the honour of explaining how each of the devices worked. 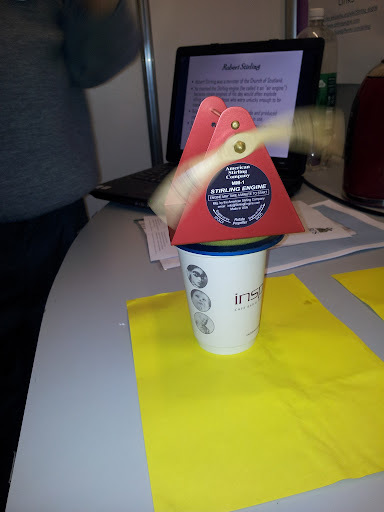 For example, the heat driven motor shown on the right was powering a propeller from the heat contained in a cup of coffee. What was really cool about this type of motor was that no steam was allowed to escape and hence the motor is suitable for use on submarines and other environments when steam escaping would not be acceptable. 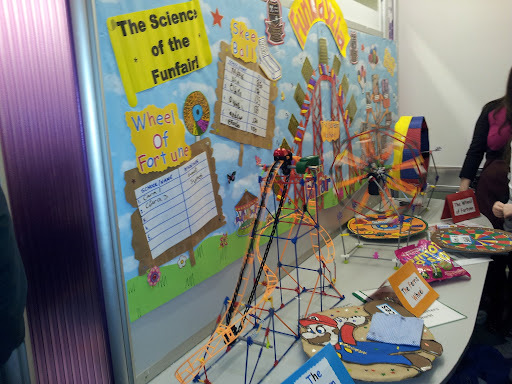 The FunBrayzia project from the boys at St Peter's National School, Bray was a very clever choice of project because they analysed the physics behing the various attractions in the funfair. I don't think it would have been too hard to get the young boys interested in funfairs. They had built very elaborate models of the various rides using and were using these to explain the physics involved. 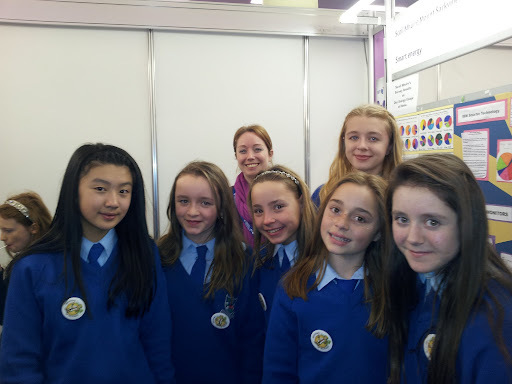 Of course there is a lot more to the Young Scientist exhibition than just the PrimaryScience section. I will write up a fuller report later when I have a chance.